Our practice is committed to maintaining the confidentiality of your personal health information.Your medical record is a confidential document. It is the policy of this practice to maintain the security of personal health information at all times and to ensure that this information is only available to authorized members of staff. If you require an urgent appointment or have a sick child, please call the surgery on 02 6772 2233 and advise the reception staff who will organise the same day appointment. Appointments can be booked either by calling 02 6772 2233 or by booking online by using the green BOOK ONLINE tab on the right-hand side of this screen. A simple registration process is initially required after which you can book, cancel and review your appointments online. You can also download and install an App from Google Play or the App Store for Smartphones and Tablets. This will enable you to book, cancel and review appointments as well as receiving reminders on the go on your mobile device. Standard appointment time is 15 minutes. Longer appointments may be necessary if you are a new patient, have a number of issues, have forms that need to be completed, require a medical, or require a minor surgical procedure. Although the doctors attempt to run on time, it is not always possible. If you are concerned please call prior to your appointment to check if the doctor is running on time. We will send you an SMS reminder the day before your appointment. Please advise our receptionists if you do not want to receive a reminder. If you or a family member requires an interpreter service we can organise this for you, please advise us of this at the time of booking your appointment. New patients are welcome at our Clinic. All new patients are required to complete our New Patient Form. For your convenience, you can download the form here. Please fill it in and present it to our reception staff upon arrival at the Clinic. New patients who do not complete the New Patient form prior to arrival should arrive fifteen minutes prior to their scheduled appointment time in order to complete the form. As well as a completed New Patient Form, new patients should also bring their Medicare Card and any other relevant Pension cards. Should you wish to have your medical records transferred from your previous doctor we can arrange for this with your written permission. We are a mixed billing Clinic. Our fees are based on the schedule of fees set out by the Commonwealth Department of Health and Aged Care and the Australian Medical Association. They are determined by complexity, time, and individual circumstances. A standard consultation is simple (one problem) and may last up to 15 minutes. Longer and more complicated consultations, as well as excisions and procedures, involve higher fees. Fees are charged for all home visits, Workers Compensation consultations, third party insurance cases and for employment, insurance, and commercial driver’s license examinations. We will generally only Bulk Bill standard consultations for Commonwealth Pension Concession and Healthcare Card holders, Department of Veteran’s Affairs Card holders, children under up to 18 years of age and patients receiving immunisations or vaccinations under the National Immunisation Program and National Influenza Vaccination Program. All fees are payable at the end of your consultation by cash, EFTPOS or credit card. If you have concerns regarding your ability to pay please discuss it with your Doctor at the time of your appointment. We are registered with Medicare Australia Online, which allows us to process your Medicare claim for you. To receive your Medicare rebate immediately via Medicare online, you will need to have registered your bank details with Medicare. Our reception team can provide indicative costs at the time of booking an appointment. While we understand life gets busy and other commitments pop up from time to time, we require a minimum of 4 hours notice of any cancellation. This allows adequate time to allocate the appointment to another patient seeking medical care. A fee applies to non-attendance or late cancellations. 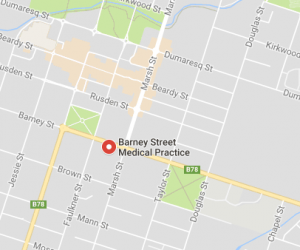 Armidale Medical Centre prides itself on the level of care we provide to our patients. To maintain the best level of care and for continuity of medical management you are encouraged to book an appointment with your Doctor for all scripts, referrals and test results. We offer brief 5-minute appointments on most days for our regular patients requiring repeat prescriptions for medication that they take regularly. There are no out of pocket expenses for patients who attend these script clinics. Bookings are essential. Please phone the surgery on 02 6772 2233 to make a Script Clinic booking. Repeat prescriptions for regular medications will only be issued without an appointment if you have seen the doctor within the last three months. An out-of-pocket fee applies for all repeat scripts and referrals requested without a consultation. The request will be referred to the patients’ usual doctor who will assess the request. This service is provided in exceptional circumstances only. When requesting referrals to specialists, it is necessary to see your Doctor who will assess the nature and urgency of the need, then arrange for you to see the most suited person if necessary. A referral will contain details of your problem, history, current medication and any relevant test results. You may request a particular specialist if you wish. During your initial appointment, your doctor will advise how you will receive your results. You are always welcome to call the surgery on 02 6772 2233 to speak with the Practice Nurse regarding your results. We will always contact you if the doctor needs to see you regarding your results. If you have not heard from us in one month, please contact us. We offer an after hours service for urgent problems. Phoning the surgery on 02 6772 2233 will give a recorded message telling you how to contact the doctor on call. Home visits are available to regular patients of the practice who are unable to attend the surgery due to certain conditions. Our doctors are willing to care for patients in nursing homes and will usually arrange to see them on a regular basis at the nursing home as well as for urgent visits where necessary. Armidale Medical Centre has visitation rights at the Armidale Private Hospital and will care for their patients when appropriate. Calls will not usually be put through to the doctors when they are seeing patients. If you wish to speak with the doctor or Nurse, please leave your name and number with the receptionist so your call can be returned at a later time. Please tell the receptionist if you are phoning for test results. Patients will always be notified if results require further action. If there is an emergency, tell the receptionist and you will be put through to the doctor immediately. If the matter is complex, a consultation may be more appropriate. Patients will always be notified if results require further action. If you have not been notified and would like to speak with someone regarding your results, please phone the surgery on 02 6772 2233 and tell the receptionist that you are phoning for test results. Our practice is committed to providing continuing and preventative care. We may issue you with a reminder notice from time to time offering you preventative health services appropriate to your care. We utilise these reminder systems for Pap smears, blood tests, immunisations, health checks and care plans. It is the policy of The Armidale Medical Centre to enrol patients in the appropriate reminder systems. If you do not wish to receive information through these methods please advise our reception team who will note your file accordingly. Access is via the driveway to the left of the building. Please do not park in the driveway or block access to the parking area at the rear of the building, as that access may be required in an emergency. We are always looking for ways to improve our services to patients. Health assessments for 45 to 49-year-olds. Health assessments for over 75-year-olds. Our doctors provide regular care for nursing home patients, and after hours visits can be arranged by ringing the practice for the number of the doctor on call. Home visits are available for regular patients of the practice. © 2017 Armidale Medical Centre All Rights Reserved.